I’m sure there are many like me who say, “I don’t want to read a book on how to play the game, just quickly show me how“. So this 2min YouTube video will do just that. Enjoy! Remember, all you need is some glass / plastic over top of your regular chess board to begin playing. It could be supported by books or anything. You could use tape to mark out where the squares are. It’s that easy. Of course you might want to print a visual set of rules to remind yourself of the dimensional movement for each piece. 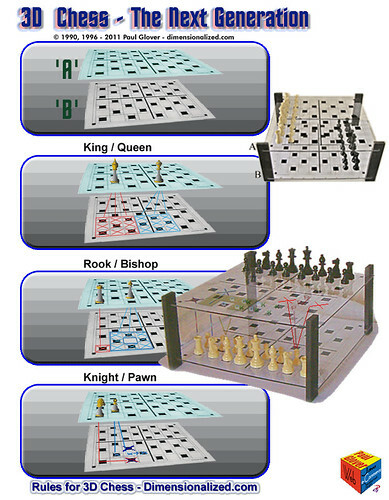 Link to a printable visual set of rules for 3D Chess. Don’t forget to tell me how it all turns out. Just post them here.